SafeBolt supports sending encrypted emails to both users who have a SafeBolt.com email address, and users who do not. If you want to send a secure email to a recipient who does not have a SafeBolt account, you can do so easily by following the instructions below. Enter your recipient, subject, and message as you would any other email. When you're ready to send your email, click on "Send SafeBolt" button on the left side of the top menu bar. NOTE: You will now see a few options for your email message. 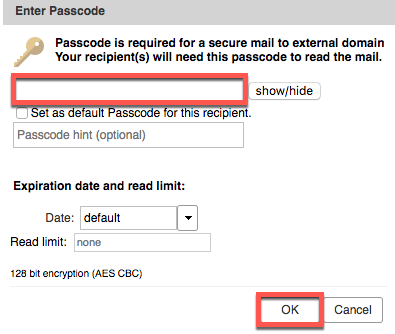 The only required option to send an external encrypted email is the passcode. Enter your desired password into the box. Your intended recipient will also need this password in order to access the email contents. CAUTION: Do not use your SafeBolt account password in this box. Make sure to enter a separate password that you have shared with your desired recipient. Click "OK" at the bottom of the pop-up menu to send your message. You have now successfully sent a secured email to an external recipient. If you'd like to learn how to send a secure email to another SafeBolt user, please click here. If you have any questions or need any further assistance, please don't hesitate to contact our support team via email or live chat.